Watches … they are awesome! And, when it comes with the smartwatches, the whole equation changes. It becomes more awesome! Today, we have the chance to review the glamorous GV80S Smart Watch phone. Not every one of us has used smart watches, but they are becoming more streamlined as each day passes by. For me, it is not the first time, but I guess there are many people who would want to give a smartwatch a try. And, GV08 smartwatch can be their best bet. Why? Let’s find out in the review. The first thing that will capture your senses is the design of the watch. It is square-ish in shape with rounded curves. The design of the watch is modern and can capture anyone’s attention in no time. You can grab the watch in 3 different colors — Coffee golden, Ivory white and Gundark. All of these colors are quite awesome. The watch uses a super soft rubber band which is made up of high-quality rubber material and is extremely comfortable to wear. To make the watch glue to your wrist, pin buckle design is used. Also, stainless steel is used for the pin buckle — hence it will never catch rust! 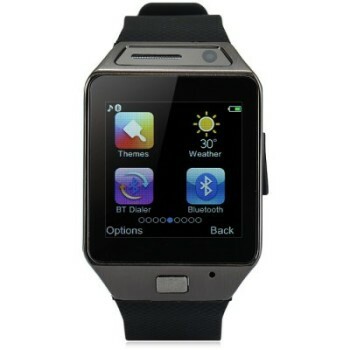 The display of the watch utilizes 1.5-inch of HD IPS display. The display is capable of 240 x240 pixels and offers touch-screen capabilities. The screen can be used to display high-resolution pictures at ease. The GV08S smartwatch also offers visual dials giving you the power to customize the watch anytime. GV08S SmartWatches are famous for what they do. Of course, the design is an important factor, but these smartwatches is all about their capabilities rather than the design. For starters, the smartwatch offers phone call from the watch. You can only connect one sim at a time. It is pretty exciting at first when you use your smartwatch to dial or answer a phone call. Other useful features include messaging and phonebook synchronization. This means that you can access vital information from the smartwatch without accessing the smartphone. 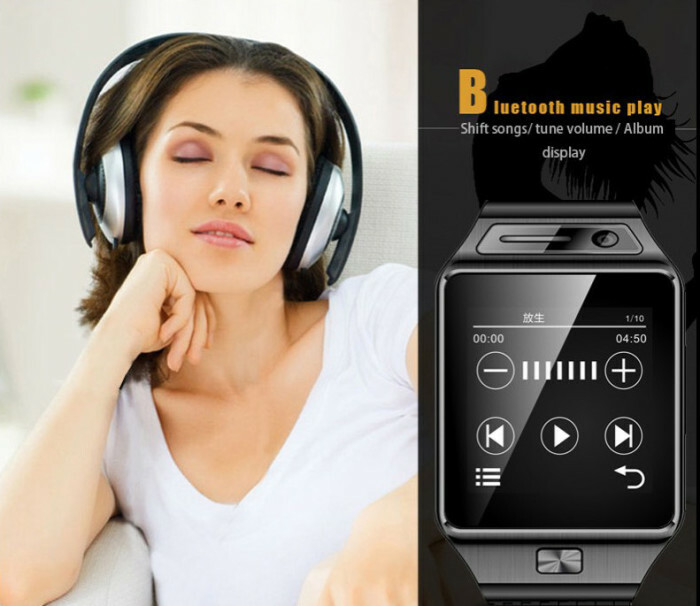 You can also use the Bluetooth capacity to play music from the watch. The smartwatch is also your healthcare companion. It offers sleep monitoring, pedometer, a sedentary reminder. For all these three health features, I love the sedentary reminder as it keeps reminding me every 25 mins that I need to get up and walk. Anti-lost feature is also included within the smartwatch. You just need to pair your smartphone with the smartwatch and you will never loose you smartphone again! This feature is quite great for persons like me as I keep forgetting where my smartphone really is! For camera lovers, the GV08S smartwatch offers remote access to phone’s camera. This way you will never have to be the camera guy and can take the perfect picture in your next party or meeting. For all the features to work, you need an Android smartphone and need to install an APK provided with the smartwatch. GV08S is a great smartwatch and I really prefer it among my collection of smartwatches. The coolest thing I loved about the watch is the DIY dials — keep giving my watch a new look! What do you think about the watch? Does it have the looks and features to replace your current smart watch? Comment below and let us know. Forgot the pass code on my GV80S anyway to fix it?